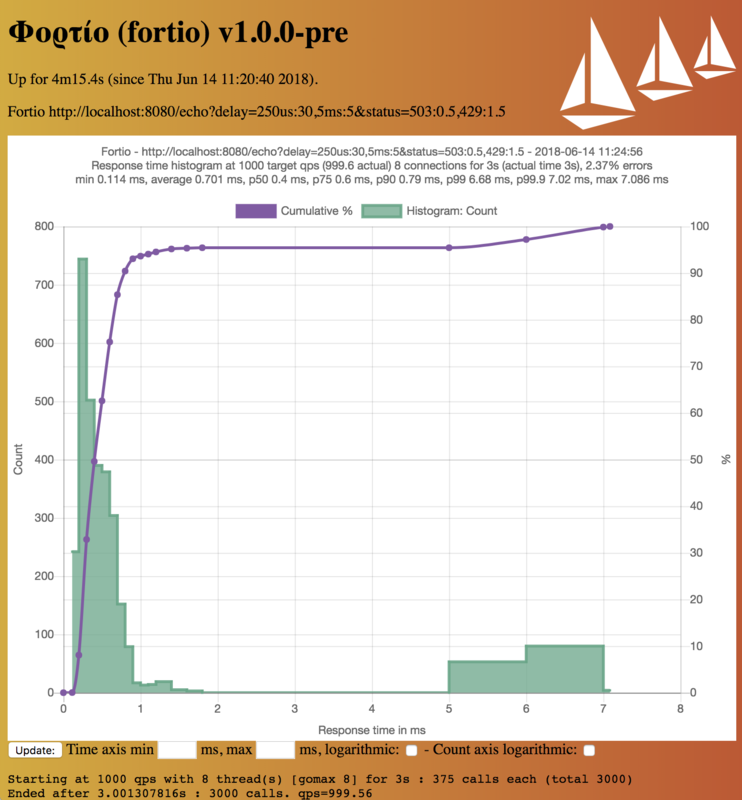 Fortio (Φορτίο) started as, and is, Istio's load testing tool and now graduated to be its own project. Fortio runs at a specified query per second (qps) and records an histogram of execution time and calculates percentiles (e.g. p99 ie the response time such as 99% of the requests take less than that number (in seconds, SI unit)). It can run for a set duration, for a fixed number of calls, or until interrupted (at a constant target QPS, or max speed/load per connection/thread). The name fortio comes from greek φορτίο which means load/burden. 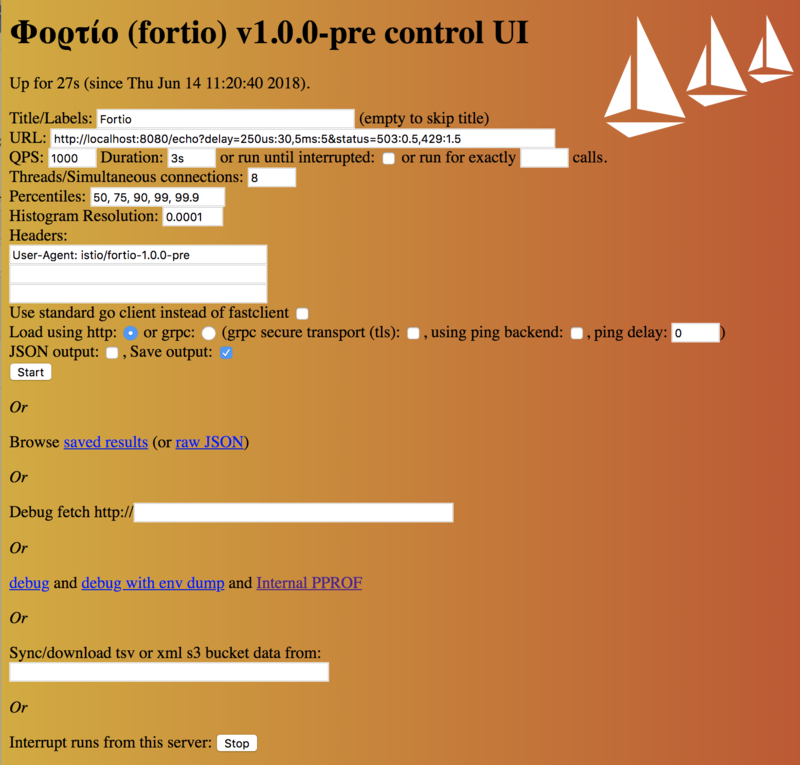 Fortio is a fast, small (3Mb docker image, minimal dependencies), reusable, embeddable go library as well as a command line tool and server process, the server includes a simple web UI and graphical representation of the results (both a single latency graph and a multiple results comparative min, max, avg, qps and percentiles graphs). Fortio is quite mature and very stable with no known major bugs (lots of possible improvements if you want to contribute though! ), and when bugs are found they are fixed quickly, so after 1 year of development and 42 incremental releases, we reached 1.0 in June 2018. Fortio can be an http or grpc load generator, gathering statistics using the load subcommand, or start simple http and grpc ping servers, as well as a basic web UI, result graphing and https redirector, with the server command or issue grpc ping messages using the grpcping command. It can also fetch a single URL's for debugging when using the curl command (or the -curl flag to the load command). You can run just the redirector with redirect. If you saved JSON results (using the web UI or directly from the command line), you can browse and graph those results using the report command. The version command will print version and build information, fortio version -s just the version. Lastly, you can learn which flags are available using help command. -n numcalls Run for exactly this number of calls instead of duration. Default (0) is to use duration (-t). You can switch from http GET queries to POST by setting -content-type or passing one of the -payload-* option. only UI server), redirect (redirect only server), or curl (single URL debug). where target is a url (http load tests) or host:port (grpc health test). is to use duration (-t). Default is 1 when used as grpc ping count. smaller than -maxpayloadsizekb. Setting this switches http to POST. Quiet mode: sets the loglevel to Error and reduces the output. index.tsv or s3/gcs bucket xml URL to fetch at startup for server modes. 14:57:12 I fortio_main.go:217> All fortio 1.3.1 release go1.10.3 servers started! 14:58:45 I fortio_main.go:217> All fortio 1.3.1 unknown go1.10.3 servers started! /path/to/fortio/server.crt and /path/to/fortio/server.key are paths to the TLS certificate and key that you must provide. $ fortio server -P "8888 [::1]:8080" -P "[::1]:8889 [::1]:8080"
A simple echo server which will echo back posted data (for any path not mentioned below). size size of the payload to reply instead of echoing input. Also works as probabilities list. size=1024:10,512:5 10% of response will be 1k and 5% will be 512 bytes payload and the rest defaults to echoing back. /debug will echo back the request in plain text for human debugging. Run/Trigger tests and graph the results. A UI to browse saved results and single graph or multi graph them (comparative graph of min,avg, median, p75, p99, p99.9 and max). /fortio/data/index.tsv an tab separated value file conforming to Google cloud storage URL list data transfer format so you can export/backup local results to the cloud. The report mode is a readonly subset of the above directly on /. There is also the GRPC health and ping servers, as well as the http->https redirector. Fortio is written in the Go language and includes a scalable semi log histogram in stats.go and a periodic runner engine in periodic.go with specializations for http and grpc. The http/ package includes a very high performance specialized http 1.1 client. You may find fortio's logger useful as well. Sample requests with responses delayed by 250us and 0.5% of 503 and 1.5% of 429 simulated http errors. Contributions whether through issues, documentation, bug fixes, or new features are most welcome ! Please also see Contributing to Istio and Getting started contributing to Fortio in the FAQ. If you are not using the binary releases, please do make pull to pull/update to the latest of the current branch.